Mason-Dixon has released the second survey out of the Show-Me state this week. Unlike the previous Survey USA poll, this one was in the field during the interregnum between conventions. The Survey USA poll overlapped with the last couple of days of the Republican convention in Cleveland. That timing may or may not have had an effect, but the differences between the two polls is remarkably stark. A +10 for Trump and now a +1 for Clinton establishes quite a range. But split the difference and it the polls collectively fit in the context of the rest of the polling in Missouri. It is a Lean Trump state, but one where Clinton's numbers are more stable than Trump's. The variation in the Trump number is the driving force behind the fluctuations in the race in the state. The addition does shift Missouri slightly -- up one cell -- in the Electoral College Spectrum and pushed the Show-Me state onto the Watch List below. FHQ will preface its comments on the new InsideSources survey of New Hampshire by saying that Donald Trump has not led in any 2016 polls in the Granite state. That said, either the nine point advantage the New York businessman has in the poll is a signal of a sea change in the race in New Hampshire or it is an outlier. The hunch here is that it is the latter, but as always, time and additional polling will tell that tale. The poll does have the effect of reducing Clinton's overall advantage in the state by about half and taking the Granite state off the Watch List. The change on the Spectrum below is minor though not without significance. The atypical Trump advantage in this poll shifts New Hampshire out of the troika it had been a part of with Pennsylvania and Virginia and now aligns it more with Iowa. NOTE: A description of the methodology behind the graduated weighted average of 2016 state-level polling that FHQ uses for these projections can be found here. 2 The numbers in the parentheses refer to the number of electoral votes a candidate would have if he or she won all the states ranked prior to that state. If, for example, Trump won all the states up to and including Virginia (all Clinton's toss up states plus Virginia), he would have 282 electoral votes. Trump's numbers are only totaled through the states he would need in order to get to 270. In those cases, Clinton's number is on the left and Trumps's is on the right in bold italics. To keep the figure to 50 cells, Washington, DC and its three electoral votes are included in the beginning total on the Democratic side of the spectrum. The District has historically been the most Democratic state in the Electoral College. 3 Iowa and Virginia are collectively the states where Clinton crosses the 270 electoral vote threshold to win the presidential election. That line is referred to as the victory line. If those two states are separated with Clinton winning Virginia and Trump, Iowa, then there would be a tie in the Electoral College. NOTE: Distinctions are made between states based on how much they favor one candidate or another. States with a margin greater than 10 percent between Clinton and Trump are "Strong" states. Those with a margin of 5 to 10 percent "Lean" toward one of the two (presumptive) nominees. Finally, states with a spread in the graduated weighted averages of both the candidates' shares of polling support less than 5 percent are "Toss Up" states. The darker a state is shaded in any of the figures here, the more strongly it is aligned with one of the candidates. Not all states along or near the boundaries between categories are close to pushing over into a neighboring group. Those most likely to switch -- those within a percentage point of the various lines of demarcation -- are included on the Watch List below. 1 Graduated weighted average margin within a fraction of a point of changing categories. If Wednesday brought red state polls, (late Wednesday and early) Thursday brought a series of surveys from traditionally blue states. One could look at the new PPIC survey of California and at first glance see Clinton up 16 points before moving on. That isn't the wrong conclusion. However, there are a couple of factors to point out about this one. First, both Clinton and Trump dropped relative to their positions in the last poll from PPIC in May. And it should come as no surprise that the reason is due to the addition of Gary Johnson and Jill Stein. Second, the addition of the third party candidates is noteworthy because they hit Trump more than Clinton from May to July. This is a phenomenon worth keeping tabs on. Some have found the third party candidates drawing more from Clinton in national polls and there have been hints of a similar trend in battleground state polling as well. Still, there are not a lot of surveys out of reliably red and blue states at this point. That raises some potentially interesting questions. Notably, if the California trend holds elsewhere, does that mean minority partisans are more likely to consider their options while majority partisans stick with the presumptive statewide winner? Yes, yes. It the in-house transition from one poll to another, but it poses an interesting question. Further east, Fairleigh Dickinson has the first look at the state of the race in the First state. Like polling in other states, the picture is one of the two major party nominees underperforming their counterparts from 2012. The undecided number is high (12 percent) as is the support in the survey going to Johnson and other (14 percent). Together, that represents a big chunk of the respondents in the poll. Nonetheless, the earliest glance at Delaware is one that has it within the Strong Clinton category at FHQ. Back west in the Beaver state, Clout Research weighs in with another poll. Clout is the only survey shop to show Trump close in Oregon. And as was the case with the California poll above, the addition of third party candidates from May to July has weighed on Trump support more than Clinton's. It is still close through Clout's lens, but Trump's narrow May lead is now a small deficit (3 points) in July with Johnson and Stein included. Comparatively, the other polls in the state are more generous to Clinton, showing a wider margin more in line with where Oregon has ended up in November's past. The only true battleground state survey of the day comes from the commonwealth of Pennsylvania. Suffolk's first trip into the field there shows a Clinton lead (+9) consistent with the recent results from NBC/Marist. But while it is a bit rosier in the wider context of polling in the Keystone state, that may be a function of the data being gathered during the first three days of the Democratic National Convention in Philadelphia. What is certain is that the poll further solidified Pennsylvania's position just inside the Toss Up Clinton category here at FHQ. 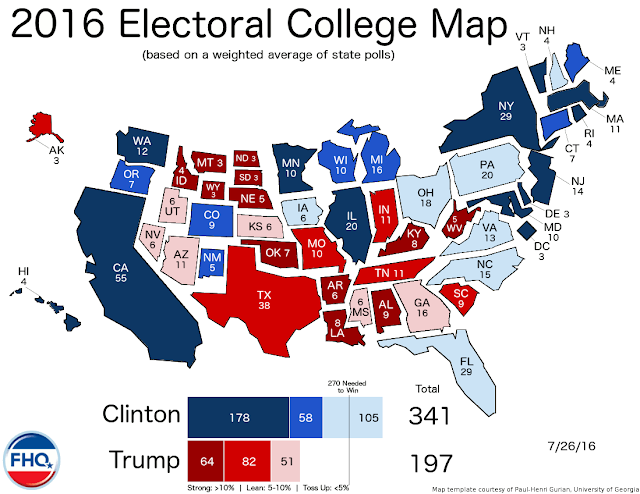 It is locked in a cluster with New Hampshire and Virginia -- two states that displaced Pennsylvania as the tipping points in the electoral college spectrum -- just a fraction of a point from the Lean Clinton category (see Watch List below). It is hard to know where to start with the initial poll of the Green Mountain state from VPR/Castleton. It is hard not to notice that Clinton is running about 30 points behind Obama 2012 in Vermont. But, but the same token, it is just as difficult not to see that Trump is in third in the state behind both Clinton and "someone else". Then again, it is also not a stretch of the imagination to determine who might be the stand-in for "someone else" for most respondents in this poll. Although he is not named, favorite son, Bernie Sanders is very likely depressing that Clinton number as the nomination process comes to an official close this week. 3 New Hampshire and Virginia are collectively the states where Clinton crosses the 270 electoral vote threshold to win the presidential election. That line is referred to as the victory line. If those two states are separated with Clinton winning Virginia and Trump, New Hampshire, then there would be a tie in the Electoral College. *Due to the way in which states with no polling are treated in 2016 by FHQ -- uniform swing -- South Carolina has seen its "average" rise. In the last month, as more polling data has been accrued, that average uniform swing has shrunk from nearly three points to just a shade more than one point toward Clinton. That development has pushed South Carolina closer to the Strong Trump category and onto the Watch List below. A couple of Trump polls from the Heartland. One could say that there was one outlier poll early on in Kansas that has made the race in the Sunflower state appear closer than it actually is. And while true, that does obscure just how much Trump is currently underperforming Romney 2012 there. That is again the case in the new poll out of Kansas from Fort Hays State. Comparatively, Trump still lags, but the margin over Clinton is more "normal". Other than the aforementioned outlier, the remainder of the polling in the state is point in the same direction: toward Trump. The same thing could be said next door in the Show-Me state. The former bellwether with just one exception has been firmly within Lean Trump territory through the lens of the polls. That positioning was affirmed by the addition of the latest poll of Missouri from Survey USA. The Trump +10 margin is right in line with where the previous Public Policy Polling survey had the race. However, that poll was in the field before the Republican convention. The Survey USA poll, on the other hand, straddled the convention; overlapping with the final two days of the Cleveland confab. 2 The numbers in the parentheses refer to the number of electoral votes a candidate would have if he or she won all the states ranked prior to that state. If, for example, Trump won all the states up to and including Pennsylvania (all Clinton's toss up states plus Pennsylvania), he would have 285 electoral votes. Trump's numbers are only totaled through the states he would need in order to get to 270. In those cases, Clinton's number is on the left and Trumps's is on the right in bold italics. 3 Pennsylvania is the state where Clinton crosses the 270 electoral vote threshold to win the presidential election. That line is referred to as the victory line. Due to Senator Sanders' motion to suspend the rules at the end of the roll call, there was no total announced by the chair of the convention, Marcia Fudge (D-OH, 11th). However, that total is reflected in the above spreadsheet. NOTE: With regard to the non-votes, FHQ is making a distinction between expressed abstentions -- of which there were only three (3) -- and votes not accounted for in a delegation's reported tally. There were 53 votes in 17 states that were unaccounted for. More precisely, the convention secretary would call out the total number of delegates in a given state delegation, and the subsequent reported delegation vote did not sum to that total. Although convention secretary, Stephanie Rawlings-Blake, cast one such vote -- one from Alabama -- as an abstention, that vote better fits the "not voting" category described above. This outcome is a function of the votes of superdelegates in those states formally casting their votes. The six states represent a little more than a quarter of the total number of states won by Sanders (highlighted in light blue in the spreadsheet). As is the case at Republican conventions, the roll call of states proceeds in alphabetical order. The only break in that in Philadelphia was Vermont. When the sequence got to the Green Mountain state, its delegation passed. When the process came back to Vermont at the end, the delegation reported its tally and deferred to Senator Sanders. Sanders then made a motion -- similar to then-Senator Clinton's in 2008 -- to suspend the rules, record all of the votes and for the convention to nominate Clinton. Different from Clinton eight years ago, Sanders failed to call for that nomination by acclamation. While Sanders' motion did not include a specific mention of "acclamation," the convention chair reported the motion as such to the convention when calling for a voice vote. That voice vote passed, the roll call concluded and Clinton was formally nominated. Though it was not heralded in the sequence, Clinton crossed over the majority 2382 delegate threshold following the South Dakota delegation's report to the secretary. There was no attempt as there was in Cleveland and has traditionally been the custom at national conventions (regardless of party) to yield to the home state of the candidate. New York did not put Clinton over the top as it did for Trump at the Republican National Convention. There were a couple of late day polls released on the opening day of the Democratic convention. Neither of them did much to shake up the map or the spectrum below. The first was a Landmark/WSB survey from the Peach state where a handful of 2016 polls have shown a race that is more competitive between Clinton and Trump than was the case in the general election four years ago. This poll only confirmed that trend. In fact, Trump's two point advantage was just a fraction under the previous FHQ average in Georgia. Georgia may be closer than is years past, but the direction of the polling thus far in 2016 has with only one exception been point toward the New York businessman. While that has been consistent, there has nonetheless been volatility in terms of each candidates' share of polling support in the state as is typical of an election cycle with no incumbent running. In the polls Georgia has moved toward the Democrats since 2012, but Nevada has shifted in the direction of the Republican Party in the presidential election polling conducted in the Silver state. Now, there has not been a lot of survey work done in Nevada, but what little has been done has shown a race between Clinton and Trump that is about eight points more Republican than the state was in November 2012. That trend line was buttressed by the inter-convention survey of the state from KTNV/Rasmussen. Trump's five point advantage keeps Nevada on the Republican side of the spectrum below but still squarely in toss up territory for the moment.